Dr. Gibbings has worked in the veterinary field for more than 17 years and provides expert care of your furry companions with a practical and candid style. A San Diego native, Dr. Gibbings grew up in Vista and obtained a B.S. degree from UC San Diego in 2007. She completed her Doctorate of Veterinary Medicine in 2012 at Western University of Health Sciences in Pomona, CA. Before getting married, Megan was known as Dr. Phillips when she was practicing at Melrose Veterinary Hospital. She currently resides in the Mission Valley area with her husband Tom and their three cats. Dr. Camacho, raised in Tijuana, Mexico, moved to San Diego when she was 22 to pursue her passion in veterinary medicine. She graduated with Dr. Gibbings from Western University in 2012. After spending 6 years working in emergency medicine and general practice, Dr. Camacho brings that expertise to West Coast Animal Hospital. Her special interests include neurology and emergency/critical care. She is fluent in Spanish which helps us accommodate our Spanish-speaking customers. 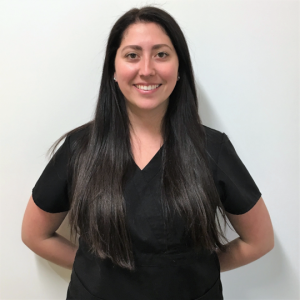 Dr. Benitez is a recent graduate of Washington State University where she earned her Doctorate of Veterinary Medicine (DVM) and was in the top 10% of her class. As a new grad from a prestigious university, Melinda’s education includes the latest research and trends in veterinary medicine. Building on her career that started as an assistant in 2010, Melinda has been able to hit the ground running. She strives to practice innovative medicine and provide compassionate care to each client and their beloved furry family members. We are thrilled to have Dr. Jess on our team to provide alternative medical therapy for pets! As a Doctor of Chiropractic, Dr. Jess treats humans most days of the week, but with special certification combined with many years of experience she is able to provide compassionate healing care for pets! As such, Dr. Greene works by veterinarian referral only. A referral form for chiropractic examination and adjustment must be completed by your veterinarian before setting up an appointment. A San Diego native, Tom graduated from Point Loma High School in 1998. His background in healthcare IT and business help him to continuously improve the client and patient experience. Tom has a BS of Computer Engineering from UC Davis and a MBA from USC. Stacy has over a decade of experience as an RVT and is one of the best in the business. Her focus is on advanced procedures such as performing dentals, teeth extractions and anesthesia administration. Allie began her career in the veterinary field in 2015 and has proven to be a quick study. Her combination of computer savvy and understanding of operations makes her an important part of delivering a smooth experience for both client and patient. Allie’s favorite part of her job is developing relationships with clients and patients and helping sick or injured pets. Tara is a recent pre-med graduate of the University of San Diego. She is getting more experience in the field while she applies to veterinary schools. Danny is new to the field but he is a quick study. He is responsible for supporting the technicians with the administration of care. Paris has been in the veterinary field since 2016. She just recently moved to San Diego and has 1 pup named Dudley.